Nowhere does quality equal time like in the emergency room. This is true not just in the case of serious emergencies like myocardial infarction, in which individual minutes translate literally into a patient’s chance of recovery, but in the sense that the emergency room is uniquely judged by its ability to provide care fast, get patients seen quickly, and, if necessary, get them admitted to the hospital quickly. As more hospital leaders come to regard the ER as the “Front Door” to the hospital, and as hospital consolidation and continued lack of primary care access drive increased ER utilization in the future, the imperative to create smooth front-end flow in the emergency room is more important than ever. Meanwhile, the share of hospital admissions that originate in the ER continues to rise. Patient satisfaction in the ER will therefore increasingly impact satisfaction scores across the entire hospital system. US Acute Care Solutions has implemented numerous improvements to front-end flow in the emergency departments which have positively impacted its hospital partners. Individually, each approach is carefully designed to bypass unnecessary steps, eliminate inefficient use of resources or simply change the culture of the ER in order to implement a better way of managing flow while delivering superior patient care. Taken together, these initiatives are improving patient care, while increasing efficiencies and lowering costs. Bedside registration takes the registration process out of the triage or check-in area and completes it as the patient is in a room and waiting for a provider. Replacing the 20- 40 minute check-in process in the triage area is a “quick” registration. The only information collected during this quick registration is the patient’s name, date of birth, and the reason for their visit. More detailed information, including insurance, medical history, and other particulars, is collected later at the bedside using either a mobile computer or work station on wheels (WOW). Moving to bedside registration on average can result in a 30 minute reduction in a patient’s total length of stay. 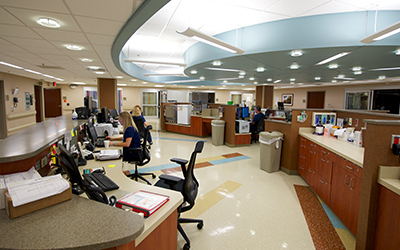 Many EDs do not have dedicated spaces designed specifically for triaging patients. Ensuring that there is a dedicated space helps nurses evaluate patients immediately upon their arrival, if needed. Physicians may also use this space for normal treatment. Patients may also be discharged directly from this area, achieving further efficiencies downstream. Advanced Treatment Protocols (ATP) expedite service and care based on common complaints. Nurses and APPs are trained on the protocols so as to speed service to patients, eliminating the “downtime” after being triaged. ATP implementation empowers nursing staff and midlevels to make clinical decisions, ultimately making care more efficient. It is important to make sure that ATP orders are comprehensive, yet as concise as possible so as to not encourage over-testing. The straight-back process presumes that whenever a bed is available, a patient should be taken straight back to the bed immediately. The biggest barrier to implementation of this initiative is culture, which is generally attached to the idea that everyone must first be triaged. The straight-back model is predicated on the idea that triage is often not necessary as long as there are resources available for the volume of patients. Implementation begins by choosing a low-volume, 4-hour block of time during which the process is tested. After a three month implementation phase, the process is reviewed once again and slowly expanded to more hours, and during busier times of the day. The goal of this process is to change the ER culture so that when a bed is available, patients are brought straight-back 24 hours a day. After implementation of this process the ED can feel less crowded; however this is usually because it has achieved its goal of moving patients through the ED faster. • Have the charge nurse survey the entire department to try to take all discharged patients out of the beds and free them up. • Move non-critical patients into hallway beds when possible. • Work with the admitting nurse and find out if any beds are available on the inpatient side. • Survey patients that have been in the ED for an excessive amount of time: discover what the holdup is and try to determine whether they can be sent home with follow-up later on. • Require that a nurse or provider notify the MEP AOC (administrator on-call) prior to going on diversion so the AOC can raise awareness to appropriate individuals. • Inpatient boarding: boarding patients in the hallways of the hospital, with each floor taking a certain number of patients. • Closely track when the ED is placed on diversion and make sure there are triggers to go off diversion immediately. The “Fast Track” program selects out sub-acute patients and provides a separate treatment area and dedicated staff providers in order to move the entire patient population more quickly and efficiently. Many beds which were formerly occupied by these patients, often for several hours, are thus freed up for other types of care. The Fast Track unit offers physician evaluation, administers and orders tests and x-rays and provides a small waiting area for ambulatory patients. These Fast Track units have dramatically reduced left-without- being-seen rates at partner hospitals, in addition to positively impacting patient satisfaction.